Is Your Dealership Guilty of Ignoring This Instant Revenue Generator? Your performance goals and your OEM light the fire under your team for more new car sales—but what are you doing to move pre-owned inventory faster? In order to make your new-car sales truly profitable, your dealership has F&I, Fixed Ops, and other add-ons in place. But have you forgotten that your used inventory can often make a higher, INSTANT return on investment? When it comes to the battle between new vs. used car sales, pre-owned makes $228 profit while new cars make a $227 loss when comparing Net Retail Profit, according to the NADA DATA Midyear 2016 Annual Financial Profile. Yet, despite the fact that used vehicles can make more profit faster, Speed Shift Media found that dealers are dedicating only 25% of marketing efforts towards used inventory, compared to 75% dedicated to new. YOU MAY ALSO LIKE: Want To Double Your Used Car Sales In 2017? Pull One Of These 3 Levers. The gurus at Think with Google identified one vital moment in the car purchase process as a “which-car-is-best” moment. Notice it’s not the “Which-dealership-has-the-most-used-inventory” moment. It’s which car is best. Shoppers at the beginning of the funnel are looking for specific vehicle types. Yet we see many dealers advertise vague slogans like, “Large Pre-Owned Inventory!” “Check out our wide-selection of Certified Pre-Owned!” and “Large stock of 223 used cars for sale!”. With only 2 dealerships being visited on average in the purchase process, no one comes in store to simply “check out” used inventory anymore. They come to buy what they already know you have, and what they already know they want. This concept isn’t the same with new inventory; people already KNOW your Honda dealership has Civics in stock! But with pre-owned (especially off brands), consumers don’t know what you have available until you show them. The solution? To move pre-owned faster, your dealership NEEDS to market your vehicles at the inventory level to show customers you have exactly what they’re looking for. As a shopper continues down through the buying funnel, they start asking more questions. Think with Google refers to these as the “Is-it-right-for-me,” “Can-I-afford-it”, and “Where-should-I-buy-it” moments. After a shopper determines they want a family crossover, they’ll eventually start adding what trim they like, what year, and what price into their search queries. Your store better be there in response, with the most specific result. Marketing tactics like Pay-Per-Click (PPC) will help your dealership post around precise makes and models—but as a consumer moves into the “Where-should-I-buy-it” moments, does this really help them locate a red 2015 Toyota Camry Hybrid LE? No. And unless you’re using a dynamically populated PPC solution, individual inventory ads require constant vigilance. Once a vehicle sells, someone needs to turn the ads off and replace them with a new listing or else you’ll risk frustrating your users. Conversely, while sites like CarGurus and AutoTrader are great hosts for your specific pre-owned inventory ads, these platforms are extremely saturated and competitive. Though they satisfy exactly how users are looking to buy pre-owned, how successful will your vehicle ad be if no one’s actually seeing it? Craigslist, while similar to other listing sites in terms of purpose, differs in that it reaps the benefits of being a homegrown, locally-driven platform—one that attracts 52 million unique shoppers a month. Plus, vehicle shoppers on Craigslist are often much lower down the sales funnel. They’re not window shopping and they’re not there to do research: Craigslist car shoppers are ready to make a purchase. Though Craigslist in the past only displayed the most-recently posted ads at the top of the Search Results Page (SRP), that’s no longer the case. 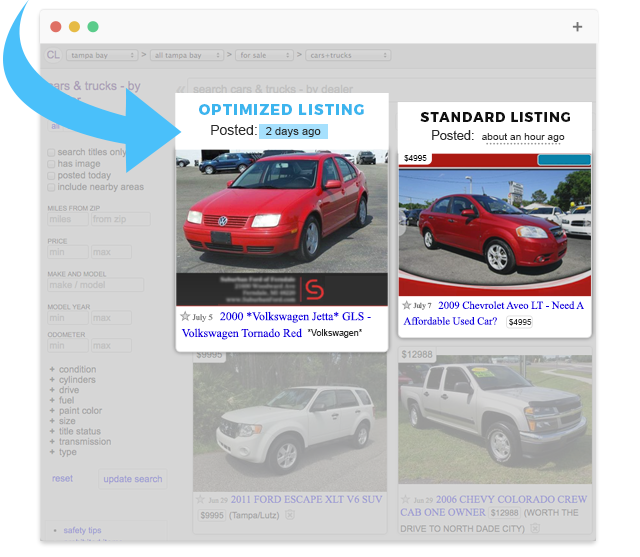 When a keyword is typed in Craigslist’s search box, an algorithm decides which vehicles show first. This means you can dominate Craigslist and wave goodbye to saturated, overly-competitive listing sites. But just like the PPC ads, Craigslist vehicle listings are still incredibly high-maintenance and require dedicated attention to detail. Enter Automated Craigslist solutions. These can often hook into your inventory feed and automatically generate ultra-specific listings, without any extra effort from you. By listing your pre-owned on Craigslist, you will help shoppers easily find their perfect vehicle and navigate them to your VDPs or encourage them to call your dealership. TIP: Look for Craigslist solutions that will scientifically choose what to post based off your market, optimize listings for conversions, and replace them once a vehicle is sold. Click here to see our solution in action. Honesty hour: When it comes to your dealership’s marketing tactics, are you putting enough focus on pre-owned inventory?